Building a home can be intimidating, but translating your dream home into “designer speak” and watching it come to life is a cool experience. Involving a Builder upfront can help with timelines, managing budgets and setting proper expectations through the process. Here is what to expect over the next three to six months during the design process. The first step involves you and your family getting together to create your wish list. What ideally do you want to see in your home? What style do you like? And, are you and your partner on the same page when it comes to style or are you building two different style of homes!? It’s important to figure this out up front. This exercise includes lots of pinning, Houzz saving, magazine clipping and maybe a bottle of wine or two, if that’s your thing! Most Builders will have a list of questions they will send you in advance to help get you thinking about how you live and what you want to see in your new home. You’ll send your wish list in advance to this meeting so your architectural designer can get a feel for what you’re hoping to achieve in your new home. The designer will require your lot information, dimensions restrictions, and a Streetscape (a look at the lot and neighboring homes) before beginning the design. At the initial meeting, you will discuss your wish list, budget, ideas and possible concerns regarding building requirements/restrictions. The designer will provide a timeline on when you can expect the first version of your plans and the next meeting. Version 1 is the first attempt at putting your ideas on paper. It typically includes a main and upper floor (if applicable). It’s essential to get the footprint (main floor) nearly perfect before moving to the basement and elevations (outside perspective of your home). Once you receive and review V1 you will meet to discuss the likes and dislikes of the plan. It is very rare that V1 comes out perfect. It takes time and many versions to mold and shape the home to your liking, so don’t feel stuck or discouraged at this stage if it’s not perfect. Sometimes, the designer will go back to the drawing board and come up with an entirely new option. The designer will make revisions, add new ideas before presenting V2. 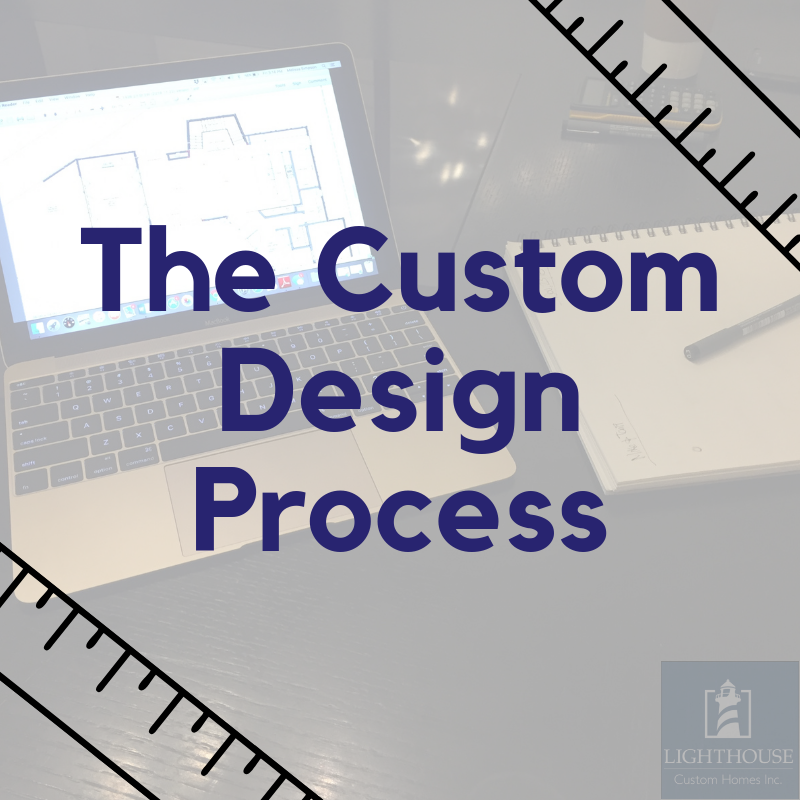 If you’re not sure if custom is the right path, Lighthouse offers some plans to start with which can speed up the design process and help you visualize. You know when you’re directing someone and they’re blindfolded? Well, that’s kind of like the design process. So, it takes a little to the left, too far, back to the right, one step forward, not that big of a step, now stop, to get it right! This might take three versions or sixteen, but you’ll get it right. Once the main and upper are to your liking, your designer will begin the basement and elevations. The main and upper floors dictate your basement layout window and mechanical placements, so they’re finalized first. The same rule of design applies; it takes a little bit of time and patience to get it right. You did it! You’ve designed a plan that you absolutely adore! You can’t wait to move in, you’re already shopping for a new couch. This set (which we call the “Tender Set”) gets sent (or tendered out) for pricing to make sure you didn’t over design for your budget. Working with a builder and experienced designer will help you stay on budget. Your builder will present either Cost Plus or Fixed Cost Contract (read more on that here) depending which you choose. If you’re happy with the pricing, you will move to the permit stage. If you need to cut a few design details out to stay on budget, your designer will modify for you. Before we can build we must get approvals from the city or county. For the City of Calgary, there are two paths your home can take, your designer would notify you through the design which option is looking like the one you will apply for. One is Contextual, this means your home design follows the rules for the lot and area requirements. This permit takes about 6-8 weeks on average depending on how busy the city is. The other is Discretionary, this means your home design doesn’t follow the rules, (ex. You build height is over the restrictions, have a unique shaped lot, or push the design envelope.). This permit takes longer about 6-8 months with an advertising period where your neighbors can weigh in on your home design. Your builder and designer will be able to set expectations for this process depending on your neighborhood and home design. The Builder and Architect work together to obtain the documents necessary to build your home. (Things like engineering, structural documentation, and energy code requirements.) The plans must accurately reflect the specifications to which your builder will build your home. This requires some coordinating between the architectural designer and the builder. This updated set of plans is called the Building Permit Set or Construction Set. Lighthouse goes one step further in order to make sure that everyone involved in building your home is looking at the same information, so we create a Final Selection Set of plans. This set of plans includes all of the small details like fireplace details, flooring transitions, millwork requirements, cabinet layout, and appliance locations. All of the decisions you’ve made through the selection process are reflected on this set. We use these plans for the duration of construction.